I am a dedicated father, husband, and love activist with over 22 years experience in flow and movement arts. Furthermore, I am a circus/fire performer, flow arts teacher, and flow tool designer/creator. 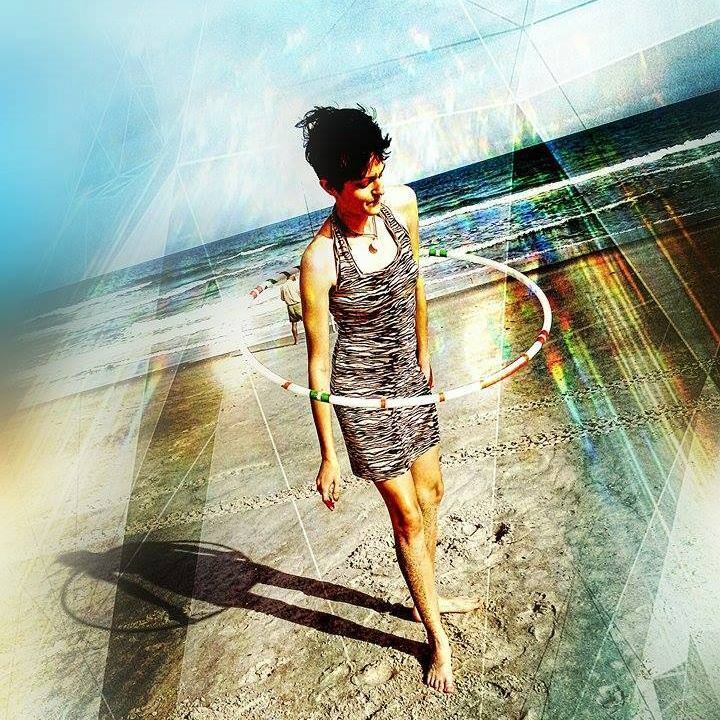 Proficient in hoop, staff, poi, rhythm sticks, acro-balance, & slackline, currently teaching classes and workshops on staff (A Movement-Art Form), Flow into Contact Staff, Hoop Dance, and Stage Presence (Becoming a Better Performer). I am a founding and active member of Full Circle Flow Arts, a movement and flow arts company that offers custom hand crafted flow tools, teaching, performance, fire zone's, booking/production/stage management, and our interactive day time activity area (the FLOW ZONE). I have also taught classes on slack-lining, acro-balance, poi, circus theater arts, natural healing and I am producing a workshop on a holistic view of wealth. I have performed on stage at many great festivals and gathering including the Lake Eden Arts Festival (LEAF), the Three Days of Light Festival (3DL), Lexington Ave. Arts and Fun Festival (LAAFF), Kinnection Campout, Gratifly, Gnarnia, Bele Chere, Organic Fest, Veg-Fest, CultureFest, Zen Awakening, and many more. I have hosted many festival workshops, flow arts classes, playshops for kids, circus summer day camps throughout the years. I created and taught a hoop dance choreography that was featured in the 2014 A.C.D.T. Nutcracker performance at the Diana Wortham Theater (NC). I also worked and trained with many of Asheville NC's great performing artists as well as performance troupes like Clan Destiny Circus and the Vegetable Circus. Born January 19, 1989 Fire performer, Dragon (fire-breather) Flow-Artist, Prop-Fabricator, Visual Artist, Musician, Grid-mapper, Teacher, Guide, Brother and Friend. My flow is inspired by so many things, spiritual consciousness, music and culture, sacred geometry, it’s a state of being; a conscious meditation. I have been an Active member of the Flow-Arts community for almost 3 years. Assisting in the setup of sanctuaries, grounds work also hosting local meet-ups for flow artists to share and collaborate skills. This past year I Performed on stage alongside Kaminanda, Drum Spyder, Numatik, Stratosphere, Living Light, Sirius Colors, and Momentology at conscious gathering three days of light. Eden arts LEAF festival Working alongside Full Circle Flow Arts in the FLOW-ZONE. I also perform with PLF (Party Liberation Front) during their Pyro Circus Events in Richmond, VA performing for DJ Reinhold, Dope Solo, DJ GON. I have performed for the band Cultivated Mind, also featured in and have facilitated performances at private parties and weddings. I am a part of the Organizing team for the Flow Arts Institute’s fire/flow festivals Fahrenheit and Flashepoint. One of my passions and contributions to this community is hosting fire safety meetings/facilitating safe fire circles for artists to perform and share their art. I perform and flow with fire/led: Contact staff, double staff, Rope-dart, rhythm sticks, Dragon Staff and Poi. Flow Arts opened a door in my life that I want to share with the world. A connection between mind, body, and spirit; a reflection of oneness. a simple presence that shines bright! I have been moving with flow-props for about 7 years, first beginning with poi, then picking up the hoop and now most recently dragon staff. I approach my dance from a whole body perspective, exploring all types of props. How different parts of our bodies participate with interconnected movements is the path that I take in learning as well as teaching. My most recent workshop “Dancing IN your hoop” delves into the importance of using our core to manipulate the hoop. I have had the pleasure of teaching this workshop as well as providing stage and roving performances at many festivals including: Three Days of Light (NC), Zen Awakening Festival (FL), and Culturefest(WV), Kinnection Campout (NC), and Lake Eden Arts Festival (NC). In addition to performing and presenting inspirational workshops at these events and many others, I also help to run the FCA Flow Zone. This is a flow movement-focused activity area presented by Full Circle Flow Arts to provide on the spot instruction and mini workshops to festival goers. I also help to run our vending booth where we sell our handmade props. My other involvements include cultivating our self-sustainable homestead and expanding my upcycled clothing design business, Perpetual Muse. No matter where I am or what I am doing, I am ever inspired to be my creative authentic self. I picked up my first hoop in 2013. Since that magical day I have pursued my passion for movement meditation through any flow props I could get my hands on (poi, levi-wand, fans, double staff) and I also pursued juggling practice. (hoops, balls, and contact juggling) 'Flow arts' is my prime choice when it comes to self expression, but I am also passionate about any and all art. I love to wire wrap jewelry, paint, draw, write poetry, sing, and play music on guitar and flute. After 2 years of following my hoopy passions, I decided that I was destined to spread hoop love every where. I started making hoops, and teaching lessons to people of all ages in my area. I performed at my Junior and Senior talent shows and took home the 1st place trophy! In 2015 I taught my first festival workshop at The Werkout (OH). As my confidence grew, -thanks to radical self expression- I began street performing and discovered another passion for improvisation and engaging audiences. I love to interact with people. I put on my first clown nose in 2014, and have been clowning around ever since! Spontaneous cosmic moments of connection are critical to the shaping of our character. I have been developing my clown act and my special sparkly self for 2 years. It has always been my dream to runaway with the circus, and I am making my dreams come true through movement medicine and the flow community!! I have been spinning hoops and other flow props for over 6 years now. An active and working member at Full Circle Flow Arts and a Flow Zone Artist for over 3 year. I have a passion for sharing her love of flow with both young and old alike. I primarily perform and teach hoop, staff, and poi, however I am always learning more and picking up new props. I have worked with FCA at such great events as LEAF, 3DL, and L.A.A.F.F..